Today I headed out towards Hillsboro to do some birding with my dad. It was a bit depressing, as I can recall birding the open fields out that way when I was younger, while now they are wall-to-wall condominiums and strip malls. The few green spaces that remain are mostly part of business parks, with "for the private use of xxxxx tenants only" signs posted all over the place. 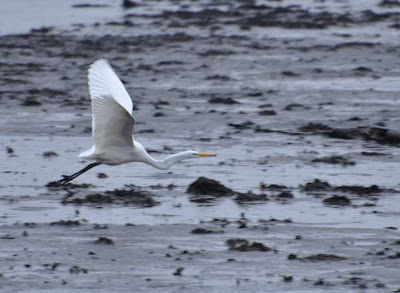 The birds, however, don't pay attention to those signs, and neither do the birdwatchers or other outdoor recreationalists, particularly on the weekends. 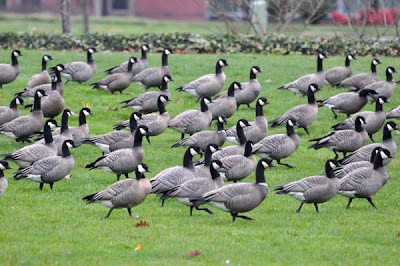 Then there were a few of these guys. 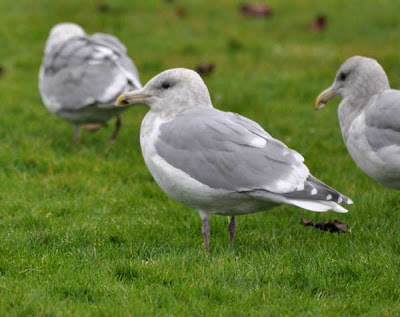 They look like glaucous-winged gulls except for the fact that they had both red and black marks on their bills. The primaries also seem to be a shade darker. 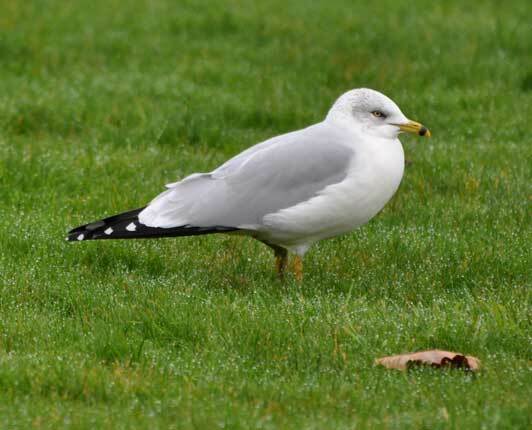 Having both red and black dots on the bill is a field mark for the California gull, but this specimen lacks the yellow legs and black primaries of a California. So, what is it? 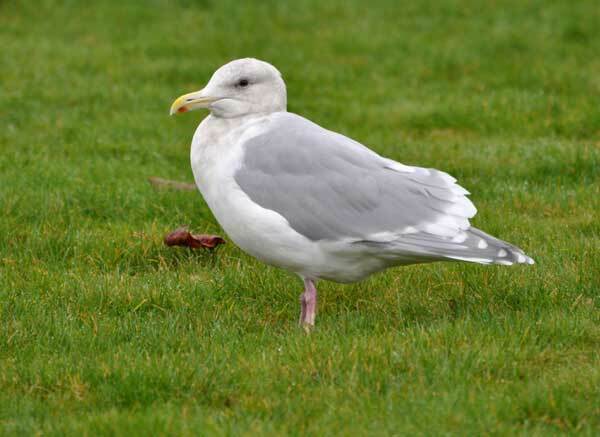 My conclusion is I think it is a third year glaucous-winged gull. Third cycle glaucous-wings look like adults except they retain a black smudge on the bill, which sometimes looks like a black tip and other times can appear like the black spot seen here. (In fact, upon closer inspection, the glaucous-winged gull in the photo above also has a tiny black dot on its beak.) Let me know if you have any other insights! Thanks to the fact that this Portland bird-watching blog post was featured in The Oregonian the other day, we decided to go look for a colony of acorn woodpeckers near the Hillsboro Public Library and the Dawson Creek business park that we didn't know about. By the time we arrived, the rain had really started coming down again. Did I mention it was also nearly freezing cold outside? We had a mixture of rain and snow falling on the drive home! Not exactly ideal birding weather but we didn't come all that way to turn back now. So out we went, first to scan the ponds. There was a little more in the way of duck activity here, with some ring-necked ducks, lesser scaup, bufflehead, and a trio of female ruddy ducks joining the mallards and wigeon. Lots of western scrub-jays flew about, and we came across a mixed flock of blackbirds including red-winged, Brewer's, and European starlings. A couple of robins were seen, as well as a northern flicker. There were quite a few oak trees around, so it took us a little while to locate the right stand where the acorn woodpeckers were hanging out, but we found them! 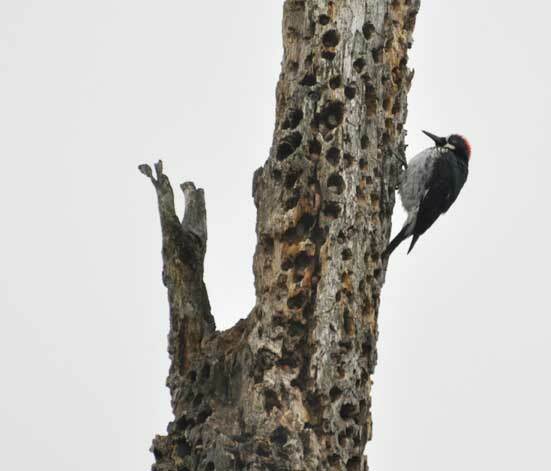 Four of these clownish-looking birds were at work on the same tree, which was drilled full of holes from top to nearly bottom. 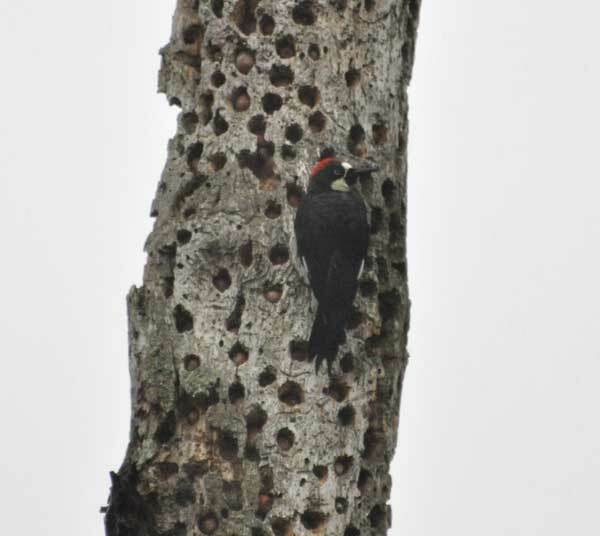 Several of the holes were stuffed with acorns, the colony's cache for the coming winter. The conditions were far from great for photography, but I wasn't about to pass up my first opportunity to get some pictures of this species. 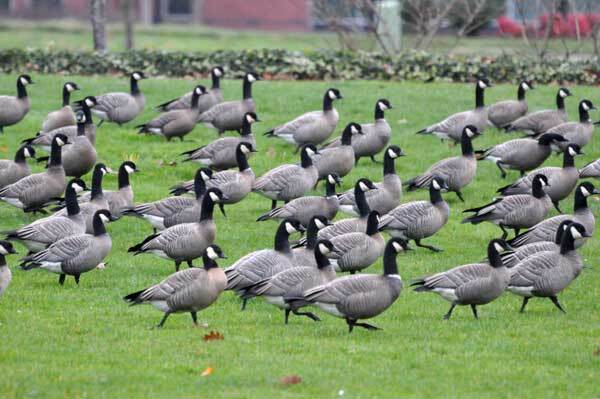 The only other place I have seen them is on the Pacific University campus in Forest Grove, where they hang out much to high in the treetops for any picture-taking opportunities. 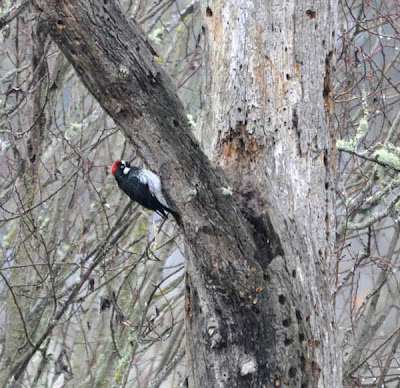 Back at home one more good species awaited: a pileated woodpecker on the telephone pole across the street! This is a species we used to see more frequently from my parents' house, and was even a regular visitor to our feeders for a time while I was growing up. After being absent for several years, my parents have just started seeing them again a couple of times in the last week or two. Despite my earlier gloom about urban sprawl, this sighting today was a reminder that some species are still managing to impressively eke out a living right in the middle of metropolitan areas. This also brings to mind the western screech-owl I heard just outside my parents' front door the other night. So the day concluded with no year birds, but it was still a pretty good outing, especially considering the weather. Any day you manage to see three woodpecker species (northern flicker, acorn woodpecker, pileated woodpecker) is a pretty good day!